Home » Government 2025 » Will the Crisis of Success lead to lockdown? Within decades we will be a more prosperous planet of 9 billion people whose escalating consumption could threaten the Earth’s biological capacity. Over the coming centuries most of the planet will join the advanced, high-growth economy. By 2050 the world’s economy will double in size. Seven of the ten largest national economies will not be from the West. For generations to come, our economic system will be built on creating limitless worldwide growth and consumption. Centuries of headlong expansion lie ahead. We won’t change course because this is who we are. Billions more people must have a higher standard of living, corporations want the profits, and governments will take bigger tax revenues. Our unstoppable growth creates a snowball of possible catastrophes: Growing water shortages, a warming Earth with rising sea levels, desertification, extreme weather, food system pressures, shrinking job prospects from technology, declining middle class incomes, large retired populations, mushrooming national debts, income inequality, and more could wreak havoc at any time. Because we all need more prosperity, nothing will turn us away from our coming Crisis of Success. As it arrives, there could be an obvious way to keep control — our surveillance infrastructure, police, legal and prison systems could become one of the world’s best integrated business systems. Corporations could sell it, multiple governments could run and enforce it, and people could be forced to pay for it and endure it. Lock-down could begin, and history’s greatest crisis could arrive: The death of freedom in a world that can’t handle our relentless quest for success. How do we rise to this challenge? As we face a cascading collision between our finite planet’s resources, our overpowering abilities and our infinite needs, how will we transform ourselves into a successful and free world? 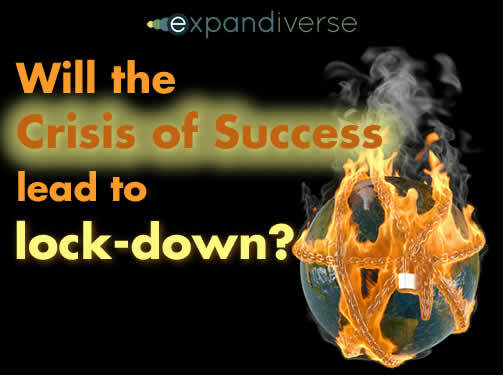 Share the post "Will the Crisis of Success lead to lockdown?"